It’s International Women’s Day and the grid is popping with gifts. If you’re not sure where to start looking for gifts, I recommend stopping by all your favorite stores. More likely than not, they’ll have a special gift set out to celebrate. If you’re on lot’s of store subscriber lists you’ve probably already got a few gifts in your inventory that were sent out. Virtual Diva’s Women’s Day gift is simply stunning. This is a fitmesh model, so you might need to use your alpha system a bit. You’ll need to join their fee free group to take this gown home. It’s really not a problem, since Virtual Diva also has several lovely past gifts out. To finish off your ballroom look, head over to The Free Dove to get this beautiful jewelry set. It’s a lovely older set that changes the metals and gems from an on touch popup menu. Enjoy your day, and shop happy! Or more precisely a leaf that happens to be the hunt object for SL F&O’s 1st Annual Hunt. So far the gifts in this hunt are fantastic. There are nearly 100 stores participating, the gifts are high quality, and completely free (0L). Today’s hunt item feature is the Rush Jumpsuit from ArisArisB&W. Rush is sized to fit Slink, Maitreya, and Belleza bodies and comes with a 4 texture HUD. These textures are so nice they leave you wishing for more. The jumpsuit has a nice slimming fit, with just the right amount of sheen. If you’re thinking those lips look familiar, it is only because they are. Estephania is Altamura’s SL F&O gift, and was featured in the Worth It post yesterday. Though the Altamura bodies are not as widely supported as other mesh bodies, their classic shaping combined with an awesome alpha HUD make it a snap to fit into clothing sized for other brands. Pop over to Queenz to pickup this casually sleek hair/hat set. It comes with separate hat and hair color HUDs. Lazuri supplied the jewelry. The Classic Pearl Set is a free gift for all store visitors. Last stop, Mangula for the Nina Elegant Heels. They are sized for eBODY, Maitreya, Slink, Belleza, and come with a HUD controller for the leather, studs, and heel. Simply join their subscriber group, wait a few seconds for the database to update, then click the gift boxes and leave happy. Happy day! It’s a new week with new goodies. We even stumbled into a new to team All Spiffed Up store. So limber up your teleport fingers because it’s going to take a few hops to pull this look together. First stop: Monomania – Clothing, Footwear & Fantasy Stuff. This cheery tropical dress is a group gift, sized to fit both classic and mesh avatars. Best of all, Monomania’s group is free to join! Fans of long wavy hair are bound to love the White Rabbit Hair from Olive. This is another lucky board style that is currently available in-world. It comes with a color HUD and different meshes that support streaks, bewbies, and a rabbit ear headband. Though tricky to view through all the hair, there are some lovely buckle and top stitching details plus a generous “Y” cutout to enhance the rear view. Mesh head and body wearers can sport a summer tan with this fresh faced skin from 7 Deadly s[K]ins. The creators at 7 Deadly s[K]ins have a talent for capturing natural details like the dusting of freckles across the bridge of the nose and the clear glossy lips. Visitors can find this skin in the gifts area behind the main counter. Simply join the free shopping group Maitreya Gifts, Sales and News and click the gift box under the group’s picture. You’ll have to make 3 trips to round up today’s jewelry. The love gem and gold summer solstice cuff bracelet is a completely free, no group join required, gift at Chop Zuey’s main store. Our model’s gorgeous pink beaded jewelry is from Chop Zuey’s beads & baubles set available at The Free Dove. We love the Sail Blue nail appliers from Livia. This fabulous group gift comes with 5 different designs that can be applied to either the hands, feet, or both. Today’s footwear is a repeat from the last post showing off the white version. These heels are wonderfully detailed and still available at No Cabide. Mango Yacht Club & Marina if you’re looking to get away from this stifling summer heat try a trip to the sea. This sim has lots of nooks and crannies perfect for photo opportunities. Boots, jewels, lingerie, pugs, and much, much more! So get your clicking fingers ready because we are rolling out the Saturday freebie list. Carla’s Pug companions are a delightful copy/mod marketplace freebie. The heart rug, pillows, and chair are also free marketplace items. This wonderful body stocking is a group gift from NylonDreams. It comes with appliers for Maitreya, Slink, Belleza, and is Omega compatible. Today’s bit of bling is a Lazuri original available at The Free Dove. Carla’s gorgeous hairstyle is a wearable free demo from Lelutka. It comes with a terrific range of color HUDs that should not be missed! Makeup, how we love makeup! Izzie’s has set out a Valentine’s gift for all visitors and it is spectacular. The gift includes: 2 eyeshadows, 2 eyeshadows with eyeliner, 2 lip glosses, 3 cheek hearts with one being tintable. Carla chose to subtly color her own cheek hearts so you have to be up close and personal to view the full effect. The best thing about Izzie’s gift is that it comes with both appliers and makeup layers so everyone whether they are classic or mesh can enjoy a makeover. Don’t forget to drop by Livia for a manicure. 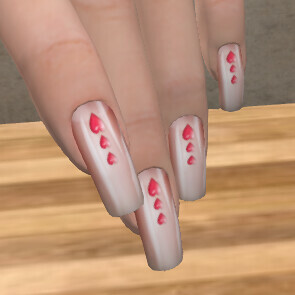 The Sweet Love gift comes with four 4 polish options made for: Omega, Astralia, Tuty, Maitreya, Slink, and Vista. Now, lets look at the item that inspired this whole outfit. The Valentine boots from CS Tattoo. These are non-rigged and resizable so every avatar can wear them. Free group, free boots, Celeste.Sanct you’ve outdone yourself and made our Valentine’s Day all the lovelier. Thank you! Happy weekend! Team All Spiffed Up decided to kick off the 2017 holiday season with a whole lot of bling. This outfit can easily take you from a cocktail party directly to your favorite nightclub. The micro mini dress, sunglasses, ring, heels, phone, and decor items are all free marketplace finds. The necklace, earrings, and bracelet are free gifts from Lazuri’s main and Fashion Island stores. All of the decor items are copy/mod so recoloring and resizing is always an option. The mirrored frames are actually quite large, to get them into this shot resizing was a must. Keep in mind this particular item cannot be resized simply by grabbing a corner tab and dragging. Resizing requires editing the linked parts. The wonderful retro clock is both attractive and fully functional. Best of all, the faux fur rug has 9 color choices, one being SKUNK! Analog Dog styled today’s hair. This glamorous style can be found in the current freeball. 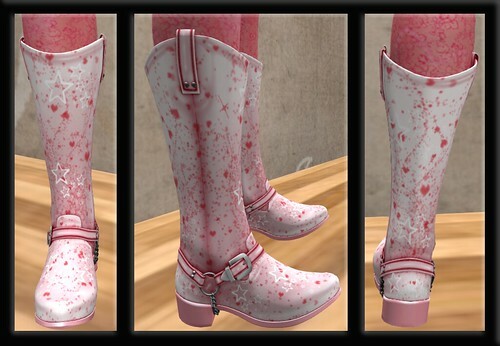 The satin wedges and sunglasses are part of a free outfit in FA Creations marketplace store. These heels are old school, meaning the feet are included in the shoe. Before our mesh body wearing friends turn up their noses at these heels, consider this; they come with an easy to use HUD that allows skin, nails, and main color changes plus resizing. Any avatar, mesh or classic can wear these.